Squirrels can be a problem in gardens and the backyard. 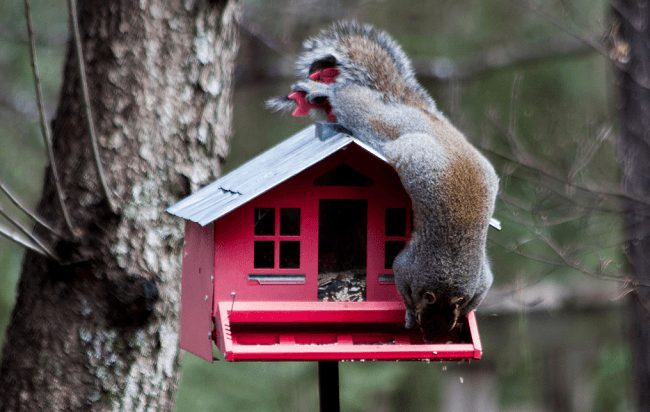 What can you do to keep them out of your way and out of your favorite bird feeder? Strong chilli powder or pepper sauce can be dusted inside the bird food. Birds are not bothered by the hot spices, but squirrels cannot put up with the burning sensation, and will leave the food alone. Squirrels can quickly empty a bird feeder, storing food away for winter use. 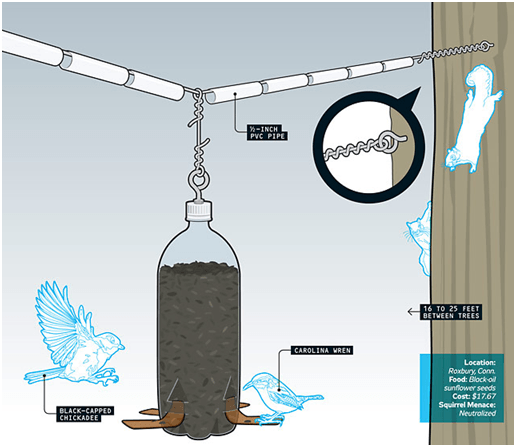 With a few simple modifications, any hanging bird feeder can become squirrel-proof. A couple of soda bottles and a clothesline will transform any hanging bird feeder into a squirrel-proof feeding sanctuary for the birds. Puncture a small hole in the bottom of each of the soda bottles with the knife. Thread the clothesline through the mount of the bird feeder. Thread the clothesline through each of the soda bottles one on each side of of the bird feeder. Hang the clothesline with the bird feeder at least 4 feet from the ground and at least 15 feet from any tree branches or overhangs that squirrels can use to get to the clothesline. Another example below demonstrates the idea behind designing systems to deter squirrels from accessing bird food. Notice the PVC pipe around a wire; this is to throw the squirrels off when they approach the bird feeder. Also, when hanging a bird feeder, be sure the feeder is at least 10 feet from any kind of jumping surfaces such as poles, porches, trees, fences and other structures. This is a homemade bird feeder using the concepts of spinning and baffles, the most effective way to combat squirrel issues. Some solutions for keeping squirrels away are simply unacceptable and not advised. In an effort to come up with a viable method that works for squirrels, avoid causing any harm to the animal. Sticky Stuff: These types of repellent products cause the most concern. The ingredients are made of a thick, sticky, gel-like material, used as a way to cover surfaces where squirrels might walk or climb. The material will repel squirrels but if it gets on a bird, it can kill them. Hot Stuff: The active ingredient in hot peppers is capsaicin. 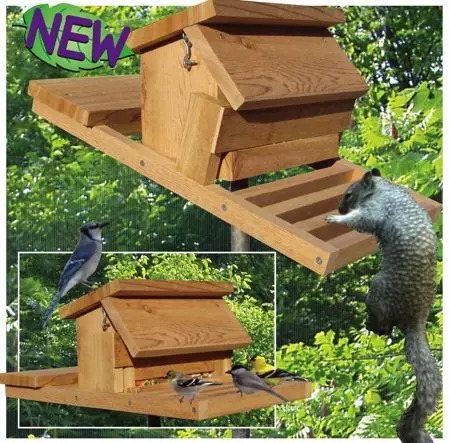 It is a common method of squirrel deterrence and even an additive in some birdseed. Birds don’t react to capsaicin the way squirrels do so it doesn’t bother them. However, when squirrels eat the treated seed, it irritates their mouths to make them not want to eat the bird seed. But why use this method when there are other ways that cause less pain and harm? Shocking Stuff: Some bird feeders deliver an electrical current that will surprise and literally shock a problem squirrel. These cause unnecessary pain and are highly unadvisable to resort to. There are many more strategies, devices, plans, and schemes you can try instead of a using a harmful method. Consult a local bird store or seek advice from experienced birders online. They will have advice about what’s being tried and what truly works. Also consider devising a platform squirrel feeder dedicated to these zany little creatures. They will become quite territorial over their feeder, keeping any new squirrels from entering the environment. Put their favorite foods like raw nuts and sunflower seeds in their feeder, and they may just stay away from your bird feeders.